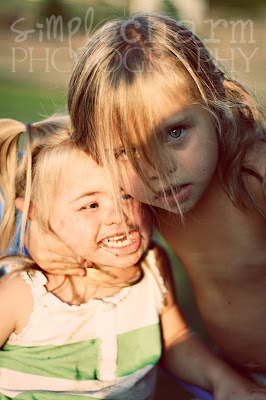 our perfectly imperfect life: The damage is done. So I was in the kitchen making microwaving dinner ... right inside the glass sliding doors you see in the picture below. As I went to walk outside with a plate full of chicken nuggets, I saw a mess beneath my feet. 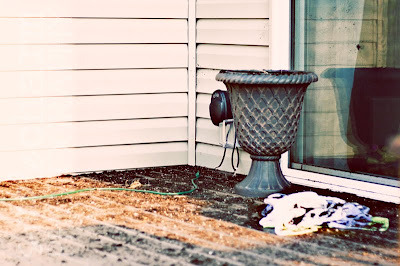 The girls apparently thought it would be fun to throw soil all over the deck ... soil from my urn that was full of beautiful dead flowers. 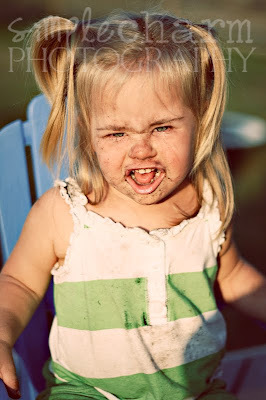 And Payton, being the artist that she is, thought it would be fun to paint her sister with soil. At least nobody can say that my kids don't get to explore their environment! Man they are both so gorgeous! Dirt and all. I've sooooo been there, except with me it wasn't dirt, it was chocolate syrup, and they canvas was my sliding glass door and my kitchen cupboard, and my floor! Payton is drop dead gorgeous. I want to squeeze her she is so cute. lol Payton sure is an artist, does she sees you making up, i mean why she wants to paint the face of Nika? I think someone needs to go back to school,haha,or is she already at school? i'm so glad you picked up your camera to document this wonderful moment. This is off subject but I have always admired your photography! I visit another site of a family that adopted from China and Guatamala (sp?). She is an amazing photographer too. I just visited her sit and saw that she has started an on-line business. I wanted to share it with you. Just click on the Flora Bella Collection on the right.